TREAT has been involved in and coordinated a number of projects over the years. This project involves the re-establishment of three habitat linkages in a wet tropical environment using an ecological restoration approach. The restoration projects have been established in the Wet Tropics bioregion of far north Queensland, known for its very high levels of biodiversity and endemism, and the highly fragmented nature of its predominately rain forest vegetation. The habitat linkages - Lakes, Donaghy's and Peterson Creek - were conceived as a potential response to issues of land degradation, localised species extinctions and patch isolation (Bennett 1999, Tucker et al 2004). All three projects traverse the private lands (Map 1) which surround three rain forest reserves; Lake Eacham (466ha) and Lake Barrine (465ha), collectively forming the Crater Lakes National Park, and the Curtain Fig National Park (303ha). Each of these reserves is located between 1km and 10kms from Wooroonooran National Park, one of the largest blocks of intact forest within the Wet Tropics World Heritage Area (WTWHA). By inter-connecting each reserve, and having linkage into Wooroonooran, ecological connectivity would be increased across this unit of the landscape. 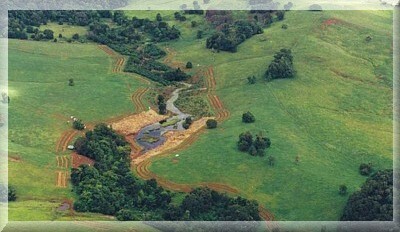 The Pelican Point Revegetation Project is a successful example of a community participatory project involving co-operation between a number of Local, State and Federal Government Agencies and TREAT, a community-based volunteer group dedicated to planting native trees on the Evelyn and Atherton Tablelands in North Queensland. A cooperative project coordinated by TREAT, TKMG and QPWS. The Anderson Road Linkage Project commenced 2001. We are hoping that the project will continue and grow in scale in future years. The projects targets the now endangered rain forest, Type 1b. Less than 10% of this forest type now remains and it is considered "endangered". Also of interest is the endangered and locally extinct Cassowary and the Lumholtz tree kangaroo - which is still seen in the area and other rain forest animals.